GEMSTONES WITH PERSONALITY! 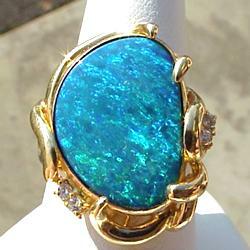 You have just discovered your fine jewelry discount source for custom gemstones! You have our assurance of quality and our 100% satisfaction guarantee or your money back. 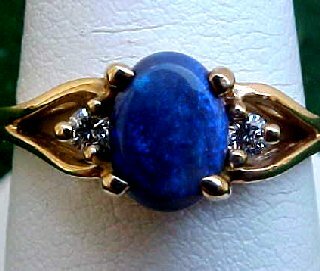 DiamondsHere has a HUGE inventory of CAPTIVATING gemstones...all individually selected for their RICH AND DEEP GEM COLOR. Not to mention! 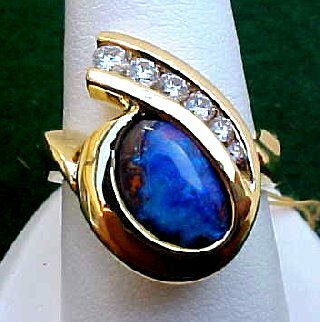 You will never be disappointed with a beautiful gemstone purchased from DiamondsHere.com! DON'T SEE WHAT YOU ARE LOOKING FOR? Just call our 800# ... let our friendly representatives to assist you! Just completed by our award winning Diamondshere Goldsmith! Our lovely genuine Ceylon Blue Sapphire 3.12CT has been set in an extra heavy custom mounting in 14KW gold. 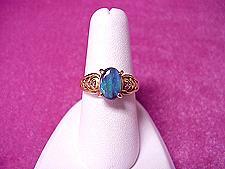 This is a wonderful piece of fine jewelry you will be proud to wear. Check out this stunning custom platinum, ruby, and diamond ring...this fancy cut Burma Ruby 2.52CT with stunning gem AAA color and fiery brilliance is accompanied with 0.30CT TW round brilliant cut diamonds all grading G-H Color, SI1 Clarity and set in solid platinum! 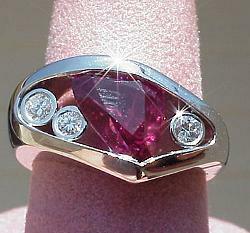 IF you are looking for a super nice 2.02 carat Burma Ruby and diamond ring...check out our SALE! Shop Diamondshere and NEVER PAY RETAIL AGAIN! Your satisfaction is guaranteed at DiamondsHere...AND...NO SALES TAX IN OREGON! 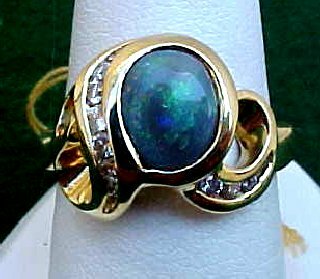 We present you with a wonderful custom Black Opal ring fashioned from 18K gold...check this out...this ring weighs 9.5 grams! This should give you an excellent indication of the quality at DiamondsHere.com! Our custom piece is refined and elegant for any occasion! 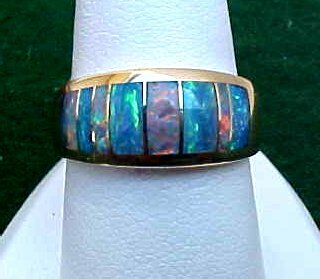 Awesome 6 x 8mm fine oval cut Lightning Ridge Black Opal set in our custom 14K gold mounting. 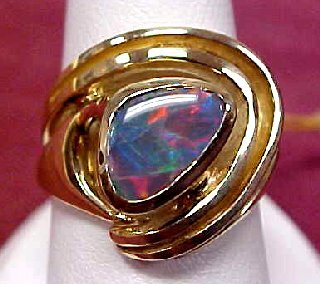 Eight stone Opal inlay in 14K gold! Bright...with super color! 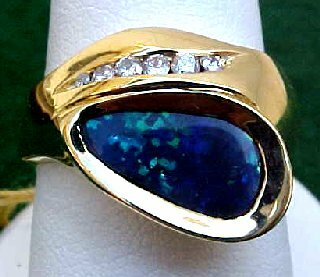 Lovely oval cut opal with dimensions 8 x 6mm with 0.08CT TW round brilliant diamonds in 14K gold! 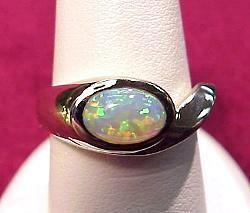 Custom Opal and Diamond Ring...The Opal weighs 5.48CT set in beautiful 18K gold...the diamonds total 0.07CT TW of G Color, SI2 Clarity enhance the beauty of this custom ring! 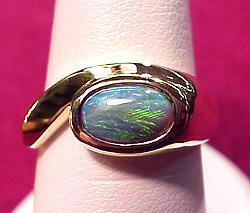 Freeform opal 10 x 6mm in 14K gold! Nice bright color! A Diamondshere custom freeform Opal 11 x 6mm with six round brilliant diamonds with 0.31CT TW all set in lovely 18K gold! Priced to sell..